The Federal Reserve kept the target Fed funds at the 0.25%-to-0.50% range in yesterday’s policy announcement. 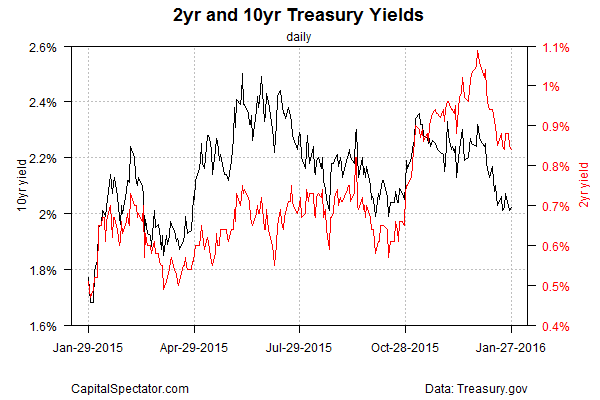 The Treasury market’s reaction was muted, with yields sticking close to the levels we’ve seen all week. But one curious development that’s worth keeping an eye on in the days ahead: the modest rise of late in the Treasury market’s implied inflation forecast, which continued to tick higher yesterday (Jan. 27), based on daily data via Treasury.gov. 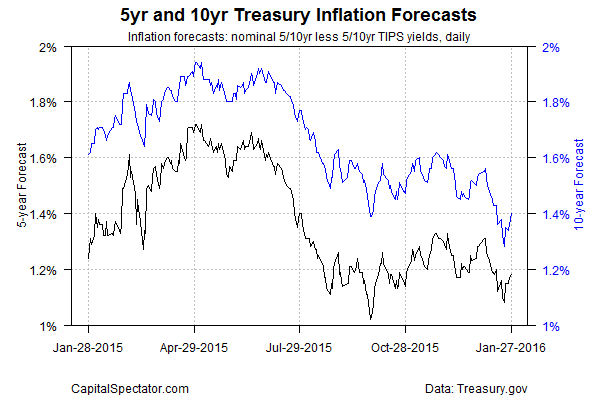 Consider how the market’s inflation forecast stacks up based on the yield spread for the nominal 10-year Treasury less its inflation-indexed counterpart. Last week this estimate of future inflation touched a post-recession low of 1.28%. But Mr. Market has reversed that slide in recent days, pushing up the expected 10-year inflation rate to 1.40% as of yesterday. Is that because crude oil–a key source of deflationary pressure in recent years–has rallied sharply in recent days? In any case, the market’s inflation estimate is still low by recent standards, but it’ll be interesting to see if there’s more upside to come in the days and weeks ahead. The decisive factor, of course: the next round of economic reports, starting with tomorrow’s fourth-qujarter GDP update. Official measures of inflation offer a relatively wide mix of numbers at the moment, depending on how you define price changes. The headline consumer price index, for instance, is up by a weak 0.7% for the year through December. By contrast, so-called core inflation—excluding food and energy—reveals that consumer prices increased by 2.1% for the past year. It’s all a big yawn for the Treasury market proper. Yields for the 2- and 10-year maturities, for instance, remained more or less unchanged this week. Note, however, that these two rates are still well below last month’s levels, when the market was convinced that a series of rate hikes in short order was fate. But until further notice, the odds are low that we’ll see a steady squeeze in monetary policy. The next major hurdles: tomorrow’s “advance” estimate for fourth-quarter GDP and next week’s January report on payrolls. Q4 growth is expected to print at a sluggish pace—just 0.9%, according to Econoday.com’s consensus forecast—less than half the rate of growth in Q2. But there’s still a widely held view that the job market will continue to expand at a healthy pace. That’s a strange combination that doesn’t lend itself to an obvious policy path… unless the incoming numbers in the days ahead deliver a major attitude adjustment.